iCAM Manager SDK provides a Microsoft Windows Application Programming Interface (API) to communicate with all iCAM7 series Iris Readers (AKA Iris Recognition Cameras). The term Iris reader implies that the device can operate independently, as opposed to the iCAM TD100 which is strictly and iris camera use to capture iris images for iris identification. Generally speaking an Iris Reader is most frequently mounted on a wall or a turnstile to allow access to a secure area, or to identify and employee arriving at or leaving the workplace. iCAM Manager SDK is an appropriate tool for a software developer creating an application to manage individual Iris Readers. The most obvious markets for the iCAM Manager SDK include Physical Access Control Systems (PACS) OEM’s, Time & Attendance Application providers, and Independent Software Vendors (ISV’s). The iCAM Manager API is used to manage the secure data storage inside the iCAM Iris Reader. 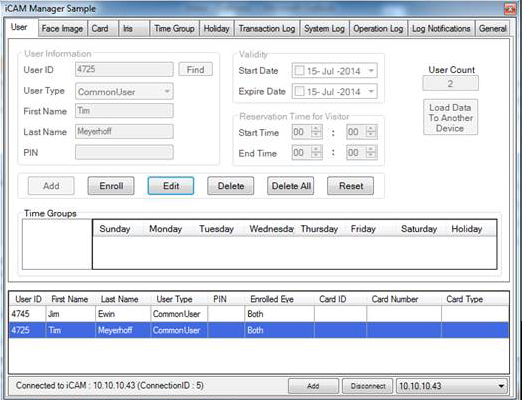 In its simplest use case iCAM Manager SDK is used to move the data in one Iris Reader to another Iris Reader across the network. Sample application code (C++ and C#) is included with the iCAM Manager SDK to demonstrate the communication interface functionality. The iCAM Manager SDK does not explicitly imply the use case of the device as a user interacts with the Iris Reader. A user approaching the Iris Reader will interact in one or more ways as described below in the Iris Reader application summary. iCAM Manager SDK is focused solely on the communication via the iCAM’s TCP/IP Ethernet interface and manages the device operation mode and its database. Integration with virtually and Physical Access Control Systems (PACS) using the standard Wiegand output. Iris Reader appears as a card read to a PACS system. Direct door control with onboard dry contact (relay closure). On-board Tamper Resistance and alarm output ( dry contact). Support for various operation modes (user perspective). Iris Recognition + Card ( two factor authentication). Iris Recognition + Pin ( Iris Reader Local PIN). Iris Recognition + Pin (PACS based PIN). Ability to collect user responses from up to six preset user programmable keys. Collection of numeric data via an on screen keypad (iCAM71XX with LCD only). On device self-enrolment (user configurable).